Bioethics Discussion Blog: Branding Patients: Beneficial or a Violation of Privacy? Branding Patients: Beneficial or a Violation of Privacy? Branding is an identification of a subject by applying a marker on that subject which can remain for the time it will be useful. Cattle are branded. Should patients be branded for one reason or another thought to be in the patient’s best interest? For example, a common hospital branding is to have a colored wrist band on a patient to identify the patient who does not wish to have cardio-pulmonary resuscitation in the event the heart stops beating. This branding is to identify those patients with that emergency when a decision has to be made about whether or not to resuscitate particularly if the patient’s chart is not readily available. But there are many other cautions that could be made easily apparent to the hospital staff by affixing some sign to the patient with a visible sticker such as allergy, prone to falling, need for isolation related to infections and others. In recent years there has been developed policies to have symmetrical sided part of the body that is to be operated upon to be branded to avoid mistaken operation on the wrong sided part. And what about privacy? It might not be unusual for others not involved in the patient’s care to become aware of the branding code (perhaps from their own personal experience) and then be able to identify the branding of another patient. For what conditions or issues would you think it would be inappropriate to brand the patient? If a person has a problem for which others should be aware for the medical benefit of that person or for the safety of others, is it ethical for such a person to be identified? Or because of the way such branding was carried out in the Nazi era on Jews and others, branding is a troublesome consideration for its application to persons? ..Maurice. 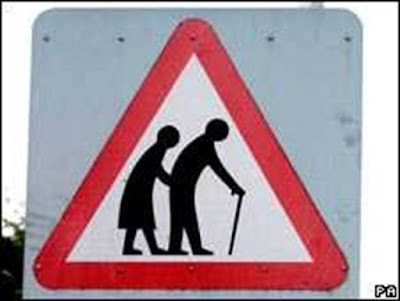 Graphic: Photograph of a street sign in Europe branding a neighborhood that the elderly and infirm are present alerting drivers to be aware and cautious. Interesting discussion. What about markings on the inside of a bracelet that could be easily checked, but not readily visible to everyone? I don't have problems with this kind of branding--as someone with severe allergies, it could save my life. This might be more of an issue for people who are hospitalized for a longer time and have nonfamily visitors. In observing those who have been in the ICU or have cancer, they seem to lose their privacy completely, with everyone thinking they deserve or have a right to every piece of medical information. Alternatively, I probably should be wearing a medical ID bracelet but don't--but I do have a copy of my medical history in readily accessible places. Other types of branding I am opposed to--doctors aren't always right and sometimes people need an objective, brand new opinion. Jerome Groopman writes about this. Personally I think people need to take responsibility for their health and be proactive in it. In the case of branding, I did so to myself. I wear a MedicAlert bracelet that has information on it that may be needed for any medical personnel to instantly respond to an issue. The fact I am diabetic, am on hemodialysis and that there are to be NO blood draws or blood pressure cuffs on my right arm (which is where my fistula for the dialysis is located). Any extended medical information is held at MedicAlert and is readily accessible by medical personnel by calling them and giving my (gigantic) numeric ID. The first problem with this whole issue is the use of the word "branding." Why this word? I don't consider using some kind of identification for safety reasons an act of "branding." Branding carries with it very negative connotations, esp. when using it in reference to human beings. So...why use that word? It's essentially a strategy used for patient safety, isn't it? That should be the focus. That act itself doesn't seem offensive to me, only the word used to describe it. A private decision should not be on public display for all to see. Where would it end? Why not hang a 5 ft copy of their chart above the bed? Maybe that person chose not to share that decision with EVERYONE. "Grampa, why is your bracelet red?" Okay. Make it voluntary, a choice patients can make. But if it's a bracelet, it can be worn higher up on the arm, or even on the ankle. It can be hidden as long as medical personal know where to find it and check. As long as caregivers check both for the bracelet AND on the chart, not just one or the other. chart and in cases of emergency such information is critical. had never saw those symbols. I personally would love to be "branded" with a bracelet identifying me as someone that refuses to be "exposed" in front of females for ANY reason. I would very proudly like to be known as a guy that takes his morals seriously and stands up for himself and for equal rights and medical ethics. I really doubt any hospital would ever take that idea seriously because none of them believe in patient self autonomy or treating patients with respect. There are all kinds of branding of patients. One of which is putting a diagnosis,(either right or wrong), in a medical record. This stays in the medical record forever. Even if it is wrong it can possibly be amended but never taken out. Hanging a label on someone is absolutley wrong. Hipa laws are only there to protect the medical profession so that they can do what they like in this respect and give them freedom to do what they want with the information. What a tragedy for people who this happens to.